Yes, reserve my phone bank registration! Please remember to let us know if you can bring additional volunteers. 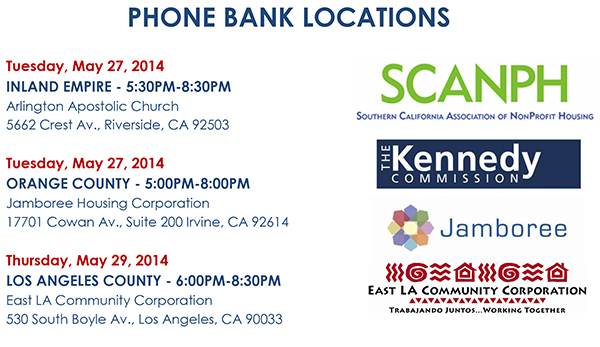 With the support of SCANPH, Kennedy Commission, Jamboree Housing, and the East LA Community Corporation, please support a phone bank to help pass Prop 41. Be a proactive! Be an advocate. Be visible! VOLUNTEERS NEEDED! 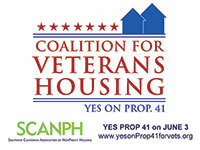 Residents, seniors, veterans, labor groups, allied realtors, high school and college students, developers, housing organizations and activist help us hone-bank in support of Prop 41. BRING A CELL PHONE (FULLY CHARGED) & BRING A FRIEND! We'll provide volunteers with call scripts, lists of voters to call, refreshments, campaign literature, poster signs. Be empowered to download, print, design or make your own lawn/window sign!